First AFT #Adjunct/Contingent Faculty Caucus #aft14! This evening saw the first ever gathering of AFT’s Contingent Caucus. It was organized by Bill Lipkin and attended by about 40 AFT contingent members and allies from around the country. Margaret Hanzimanolis acted as secretary. 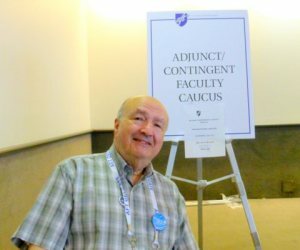 This historic event will help to give contingent faculty a greater voice within the union of 1.6 million members, of whom perhaps 100,000 are contingent academics in higher education. Thanks to Bill, Richard Gomes and Margaret Hanzimanolis for pulling this off—it’s been a long time coming! Yesterday and today saw the unanimous approval of a number of excellent resolutions that pertain directly to contingents. More to follow. I emailed Bill and you’re on the list for the adjunct caucus.